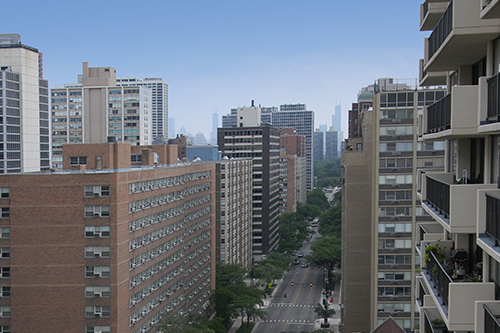 It’s been said that Chicago is a city of neighborhoods. And we are located in ten of its best. With so many options, we thought you would need a little help from unbiased strangers that we happen to agree with on their curated neighborhood guides - http://www.onthegrid.city/chicago/. For biased recommendations made by us and to see the perks and discounts you would receive at some of the best places in Chicago, click here. With a quirky atmosphere and distinctive flavor, the area has quickly become one of the North Side's most popular neighborhoods. The neighborhood's commercial district is made up almost entirely of independent, locally-owned businesses. 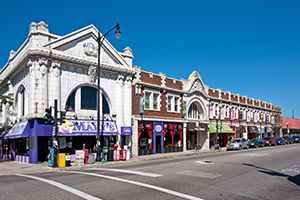 Between its specialty bakeries, dynamic bar scene and incredible array of stylish boutiques, Andersonville is a thriving example of colorful urban living. As one local resident stated, "The abundance of charming small businesses along Clark Street paired with frequent neighborhood street festivals make Andersonville its own little village in the city of neighborhoods. Learn more about the neighborhood with this interactive map featuring local businesses. Nestled along the lakefront just north of Lakeview, Buena Park had been named to the National Registry of Historic Places. That designation encouraged the restoration of the pre-World War II courtyard buildings, six-flats and turn-of-the-century mansions found along the neighborhood's tree-canopied streets. As a small lakefront community, Buena Park is an excellent location for those who relish an active lifestyle merged with a quaint residential setting. Check out a video of the Buena Park neighborhood as well as some of our properties. As you stroll through the Fulton Market District, you can feel the vibrant energy and see the neighborhood’s rich history beside you, including the industrial grit and the faded-brick buildings. Modern urban culture and bustling commerce now saturate the area. Creative and architectural firms; chic condos and apartments; boutique hotels; and trendy shops, eateries and galleries have either replaced or moved alongside meat company buildings and cold-storage facilities. 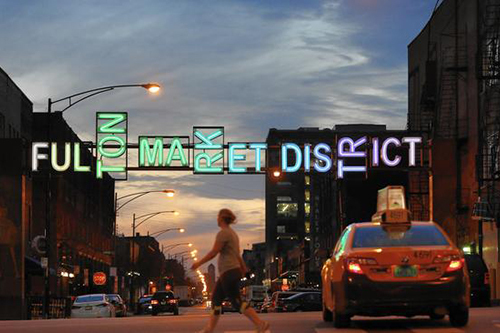 This unique fusion of past and present makes Fulton Market one of Chicago’s most sought-after neighborhoods. With sweeping views of the Chicago skyline from across the river’s south branch, Fulton Market also has the feeling of being immersed in, yet independent from, downtown Chicago. 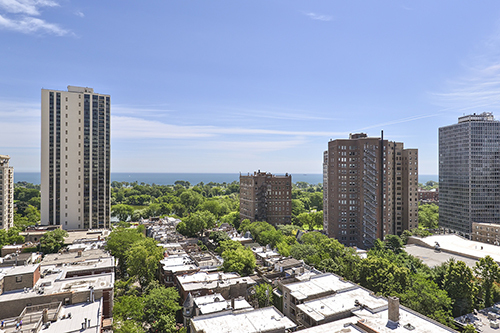 Anchored by a beautiful stretch of shoreline to the east and dotted with train stops along two ‘L' lines, Lakeview is one of Chicago's liveliest and most accessible neighborhoods. Several distinct areas — East Lakeview, Central Lakeview, Boystown, and Wrigleyville — meld together to form a lakefront community that celebrates diversity. Lakeview makes full use of its slice of Lincoln Park, a 1,200-acre oasis dedicated to the outdoors. Here you will find the scenic Lakefront Trail, a golf course and driving range, boat harbors, a bird sanctuary, tennis courts and grassy playing fields that are also perfect for picnics or just soaking in the views. 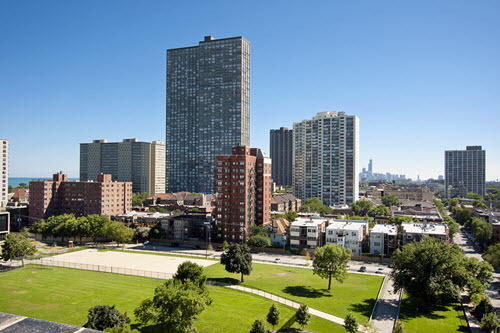 In Lincoln Park, Chicago's motto, "urbs in horto" or "City in a Garden", truly comes to life. Historic landmark districts sit next to peaceful parks, while quiet, tree-lined residential areas give way to bustling business corridors. 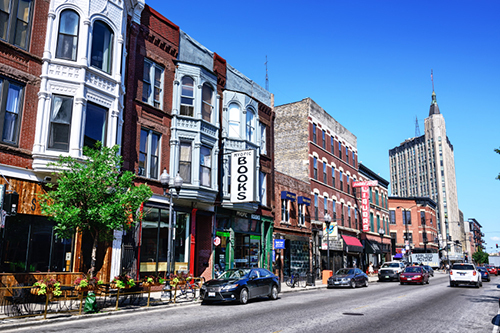 Armitage Avenue is lined with independent boutiques and high-end retailers; Clark Street is packed with cafes, restaurants and sweet shops that spill out onto the sidewalks during warm weather; and Lincoln Avenue buzzes all night with bars and taverns. Lincoln Park is a diverse art and entertainment destination with a plethora of museums, top theaters, and live music clubs. This neighborhood's namesake park contains 1,208 sprawling acres of green space with a free, year-round zoo, a nature museum, and conservatory. The lakefront trail and beaches are set against a backdrop of downtown skyscrapers. 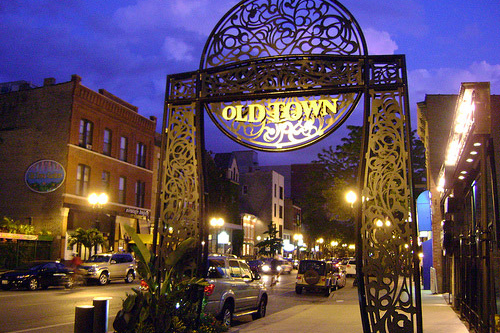 Due to its close proximity to the lake and downtown, Old Town is a neighborhood destination. Victorian-era buildings, brick alleyways, and narrow, tree-lined streets are charming backdrops to a busy main strip that runs along Wells Street between North Avenue and Division Street. For entertainment, comedy takes center stage with The Second City and Zanies Comedy Club providing the laughs. Shopping is quite eclectic and you can pick up specialty spice blends, imported olive oils, chunks of fudge, rare wines and premium cigars all in one single spree down Wells. Family-owned restaurants are fixtures of the neighborhood and the variety runs deep: barbeque ribs, sushi, steak frites, pasta, and pizza are all noteworthy. You can continue to soak up area history at one of the more seasoned taverns, though new bars and boutiques keep Old Town young. 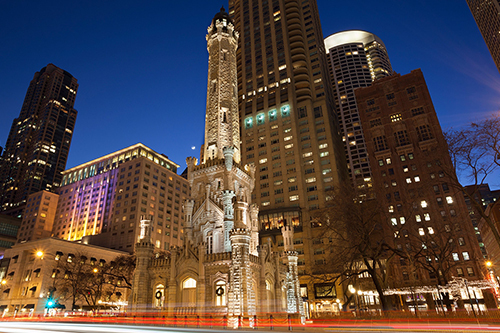 River West - once a part of River North - has undergone a rebirth over the past 10 years. In the process, it's become an increasingly desirable location for people looking for peace and quiet, while still having access to the city. 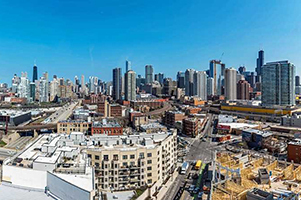 Bordered by the Kennedy Expressway to the west and the Chicago River to the east, the area has become a hot spot for those seeking quick travel to both the western suburbs and the downtown area while still enjoying the buzz of a big-city neighborhood. Spanning the lakefront roughly from Devon Avenue to Howard Street, Rogers Park has the distinction of being the city's northernmost neighborhood. 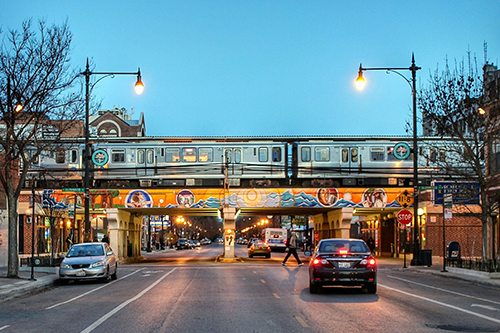 But easy accessibility by way of multiple train stops means that the unique dining, arts, culture, and entertainment found in Rogers Park are never too far away. And the sound of waves crashing along the shores is near as well, as nearly all the streets leading you east end at public beaches and parkland on Lake Michigan. Commercial districts tout a robust theater scene and music clubs. There are plenty of galleries, quaint coffee shops, and late-night dive bars. A transformation — or rather, an explosion — has taken place among the former factories, wholesale markets, and warehouses on the edges of downtown. 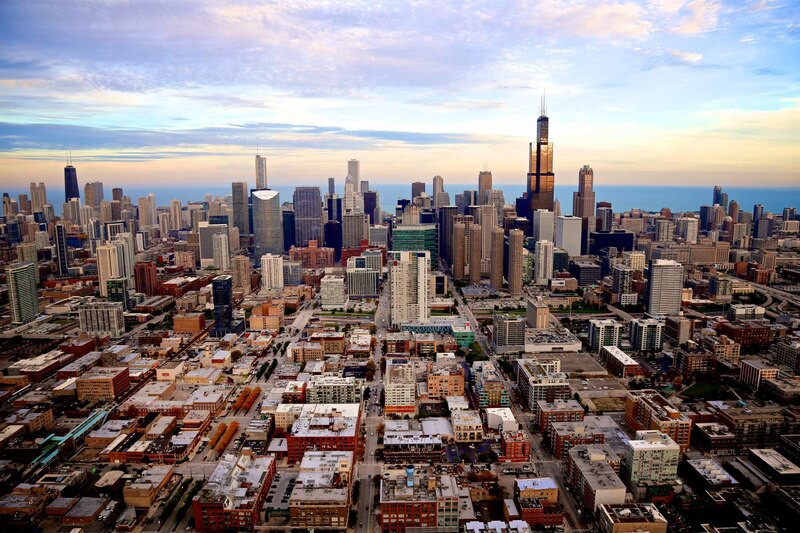 One of Chicago's fastest-growing neighborhoods, the West Loop is a study of contrasts. Still somewhat industrial and gritty, the slew of new and popular restaurant openings has centered around Randolph Street and nearby Fulton Market, aptly named "Restaurant Row”. You can go from sushi bar to sports bar, bakery to a brewery, wine tasting to taquería, butcher shop to a champagne salon, late-night diner to futuristic cocktail lounge — all within this stretch. Specialty foods galore also abound at the nearby Chicago French Market, the city's only year-round, indoor marketplace. Interspersed among the West Loop luxe lofts and the chic retail boutiques are galleries, design stores and antique sources that give the area its creative-edginess. 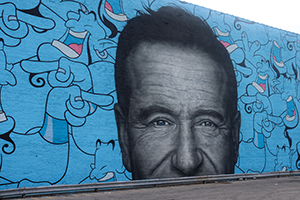 One of Chicago's creative epicenters lies just northwest of downtown Chicago in Wicker Park and Bucktown. These sister neighborhoods are famous for boutique shopping, esoteric book stores, and countless art galleries. If you love craft cocktails and have an affinity for independent clothing designers, there's no better area to sip and shop in the country. The area has recently become an influence on Chicago's Michelin-rated dining scene, boasting some of Chicago’s most sought-after restaurants. The neighborhood's most enduring quality is its shopping. Along North, Milwaukee and Damen Avenue, you will find a mix of vintage shops amid independently owned boutiques. On the same blocks are nationally recognized designers and major retailers.